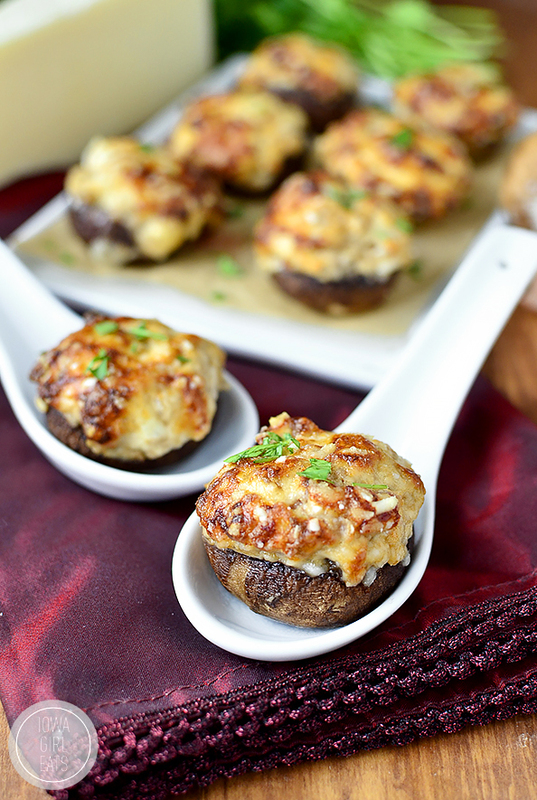 Gluten-Free French Onion and Prosciutto Stuffed Mushrooms taste like creamy French Onion Dip spiked with salty prosciutto. The perfect party bite! You didn’t think I’d send you into one of the biggest finger-food-friendly weekends of the year (Super Bowl weekend, y’all,) without a couple different options to nibble on while watching the big game now did you? Pssht. I love you and one bite appetizers far too much to do that. 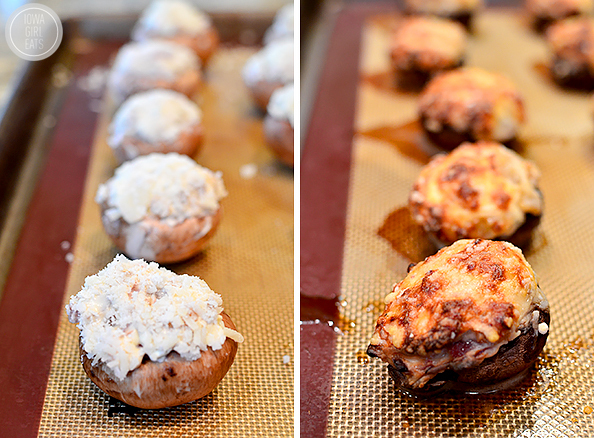 That said, pre-heat your ovens and grab a platter for Gluten-Free French Onion and Prosciutto Stuffed Mushrooms! Homemade French Onion Dip and prosciutto, which would undoubtedly take up a large portion of my last meal on earth plate, along with really good Pad Thai and smoked cheddar cheese, in case you were wondering, collide in these creamy, sky high-piled, gluten-free stuffed mushrooms with a chewy, parmesan crust. Sha. Blammy! Have you ever illogically dismissed something for a number of years only to turn around and go over-the-top bananas for it? Big Bang Theory: wouldn’t watch it for four years because the guy from Roseanne, a show I always hated, starred in it. Ben finally convinced me to give it a chance then I binge watched every single episode on TBS in 2 months and haven’t missed a new episode yet. Yoga: thought it was for granola-loving Californians with beach access and an aggressive Lululemon habit (that’s the jealousy talking.) Gave it a try a few years ago and it swiftly got me in the best shape of my life. Remind me why I stopped doing yoga again?! Oh right, the chaturangas were giving me tennis elbow. Any form tips? Pillow top mattresses: up until last year I thought a mattress was a mattress. Then Ben and I ditched our ancient bed, splurged on a pillow top mattress, and I quickly became aware that at a mattress is not just a mattress! Every single night when I go to bed I tell Ben, this is my favorite part of the day. It’s like sleeping on a cloud. Mushrooms: I know I sound like a broken record but since accepting mushrooms into my life a couple months ago I eat them at least once a week – usually in this Leek and Mushroom Chicken Skillet, but also just like, sautéed with butter and garlic, tossed with gluten-free pasta and parmesan cheese, and under a mountain of French Onion dip and prosciutto. I am finding dozens of excuses to include them in my weekly meal plan – and for special occasions, too! 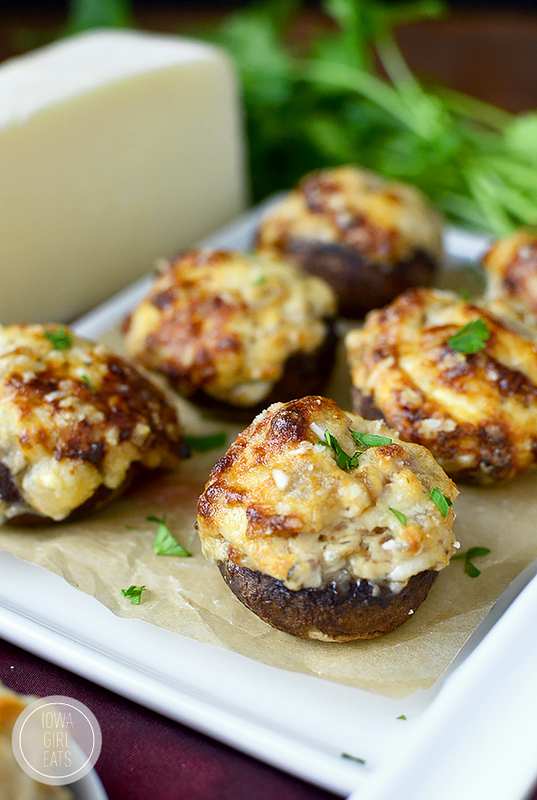 Gluten-Free French Onion and Prosciutto Stuffed Mushrooms are the perfect addition to your Super Bowl spread. A perfect one-bite app that’s savory, creamy, and has a parmesan crust that’s a little bit crunchy and chewy at the same time. I feel like melted parmesan cheese just gets me. It tastes so darn good. 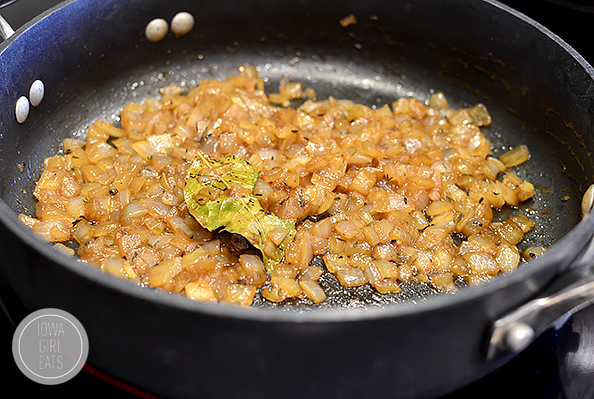 Start by making the French onions which is fancy talk for simmering 1 chopped jumbo sweet onion in 1 Tablespoon butter, 1/2 cup beef broth, 1 Tablespoon worcestershire sauce, 1/4 teaspoon dried thyme, 1/2 teaspoon sugar, and 1 bay leaf until softened and a gorgeous, caramel-brown color, about 20 minutes. Give them a stir here and there – you definitely don’t have to babysit them. Let the onions cool slightly then add to a large bowl with 8oz 1/3 less fat cream cheese that’s been softened to room temperature then mixed with 1/2 teaspoon garlic powder and pepper to taste, and 2oz chopped prosciutto. 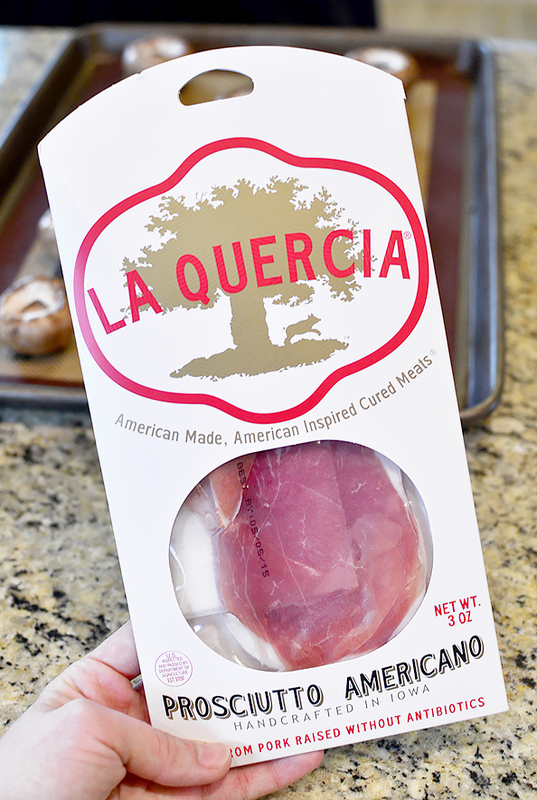 I almost always use La Quercia prosciutto (pronounced la-quare-cha – try it, it’s fun to say) for my prosciutto-eating needs. It’s world renowned and made right here, about 20 minutes away, in Norwalk, IA! The ingredients are pork, and sea salt. Love it! 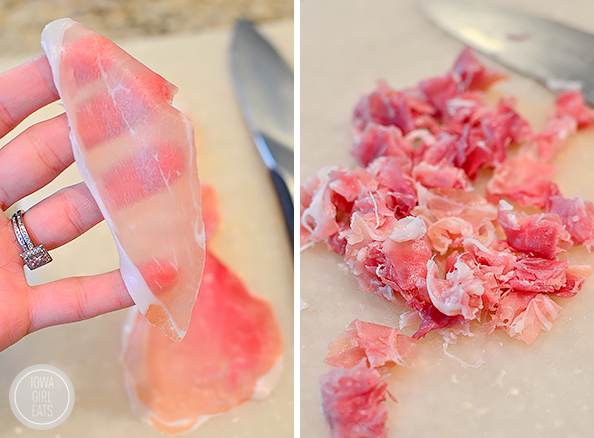 La Quercia’s prosciutto is sliced tissue paper thin and is soft and buttery. It is SUCH a treat and totally worth a few extra bucks if you can find it. Ok, filling done, time to focus on the fungi! I can’t. 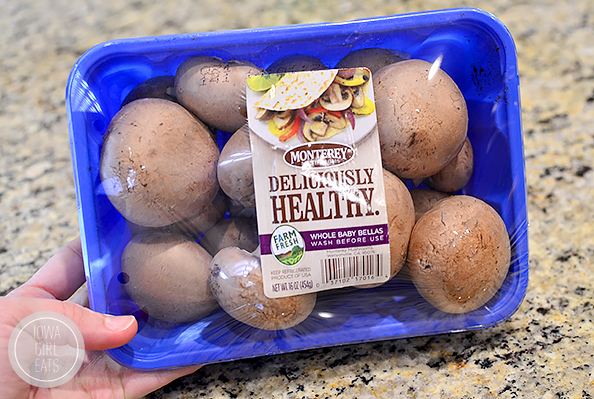 Anyway, you’ll need 24oz baby portobello mushrooms, which could also be called crimini mushrooms at your grocery store. 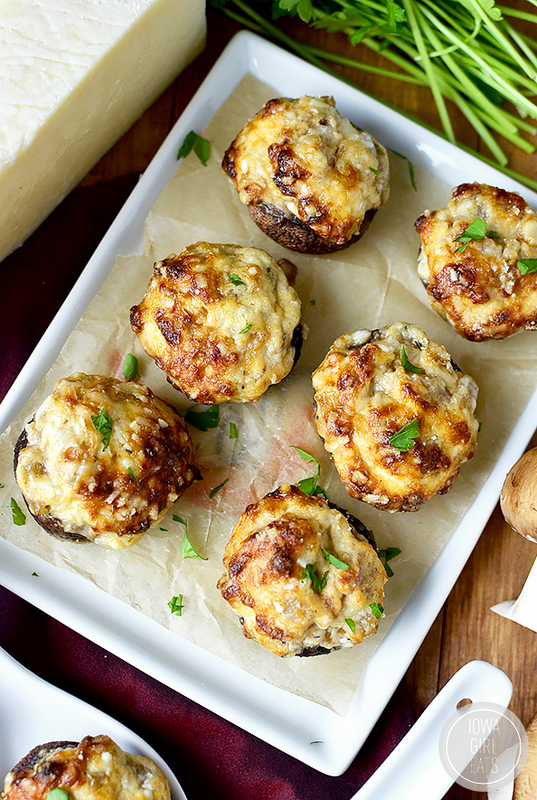 If you can’t find these you can of course use regular white button mushrooms – you’ll need the same weight, just plan on having more stuffed mushrooms as they’re typically smaller than baby bellas. Pop the stems out then fill each mushroom with 1 Tablespoon filling (I used a cookie scoop.) Use a little less filling for smaller mushrooms, and a little more for bigger mushrooms, then use a small spoon to make sure the filling is pressed into the mushroom cavity. Now’s the fun part – making the parmesan cheese crust! Put 1/2 cup freshly grated parmesan cheese in a small dish (I just used a measuring cup,) then lightly roll each mushroom top in the parmesan cheese until it’s completely covered. Easy peasy. 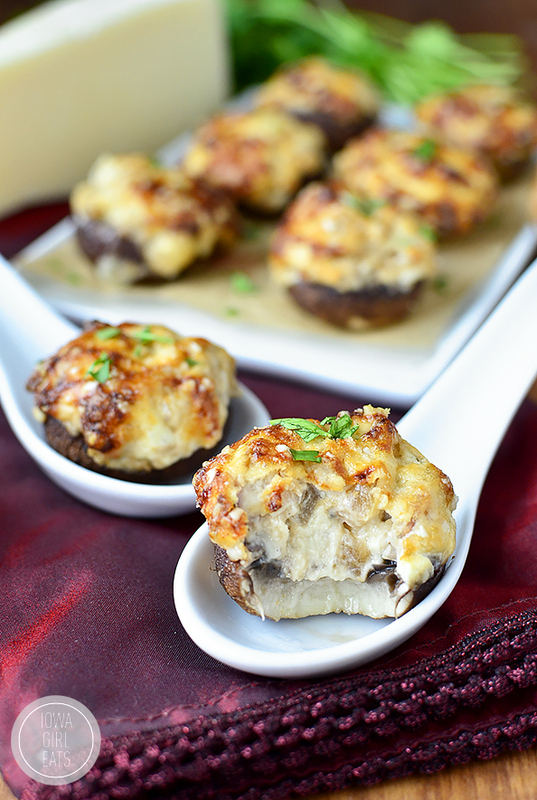 Place the stuffed mushrooms back onto the baking sheet then bake for 20-22 minutes at 350 degrees or until the tops are nice and golden brown. Melt butter in a large skillet over medium heat. Add onions, beef broth, worcestershire sauce, sugar, dried thyme, bay leaf, and a little salt and pepper. Bring the mixture to a boil over high heat then turn heat back down to medium and cook, stirring occasionally, until onions are soft and dark brown, 20 minutes. Cool slightly. 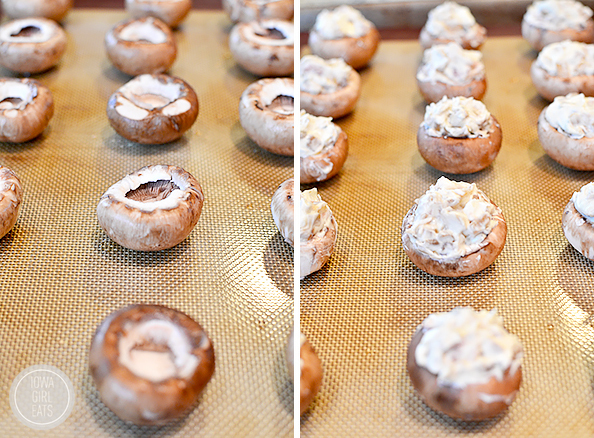 Meanwhile, remove stems from mushrooms then place on a parchment paper or silpat lined baking sheet. Preheat oven to 350 degrees. Pour parmesan cheese into a small dish. In a large bowl stir together softened cream cheese, garlic powder, and pepper to taste. 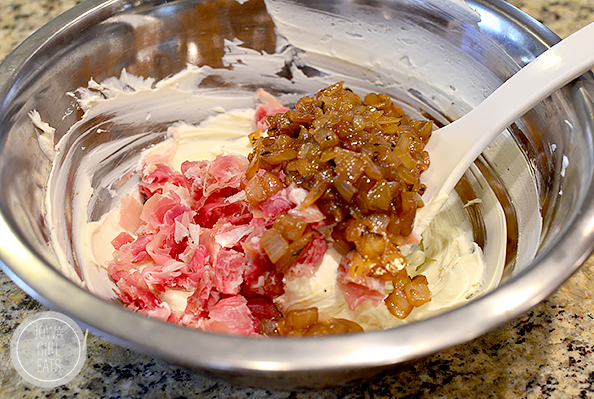 Add chopped prosciutto and onion mixture then mix until combined. Scoop by the Tablespoon (I used a cookie scoop) into mushroom caps - a little less for smaller mushrooms, a little more for larger mushrooms - then use a small spoon to make sure filling is packed into the cavity. Roll tops gently in parmesan cheese then place back on baking sheet and bake for 20-22 minutes or until tops are golden brown. French Onion Dip is one of my favorite foods and mixing it with prosciutto, stuffing it into a mushroom cap, and topping it with parmesan cheese takes it to a totally new level. Hope you love and goooo (insert your team here)! These look so delicious! 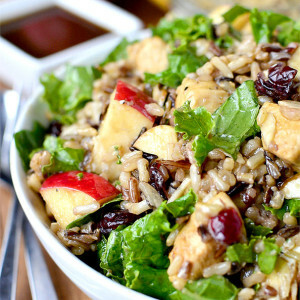 I love the flavor combinations that you used! I’ll have to make these next time we have company in town. I’m sure they will be a hit! Yes! 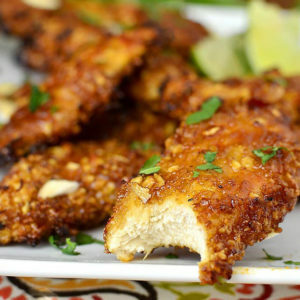 These look finger licked good! I live in So Cal and you nailed it! lulus are so popullar! Crazy expensive habit! Gah!!! These look so freaking amazing. Hopefully some day soon I will save up the time and energy to give them a try! These look amazing. My husband would gobble these up! I might have to make these for the big game on Sunday. Just in regards to the elbow Chaturanga issue, it might be an issue of your arms being to wide, or maybe you need to keep your elbows in closer to your body when you go down knees, chest and chin to the floor. That’s a common mistake, you’re not alone. I’m a yoga instructor, so I’ve done plenty of Chaturangas myself! Yum!!! i know what I’ll be making for Sunday! These look awesome. 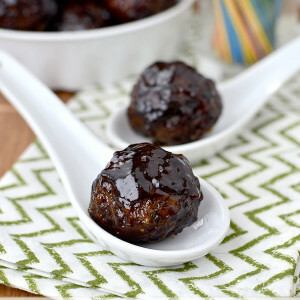 They are one of my picks for a yummy app for Valentine’s Day spent at home. Hope you get back into yoga soon. Yoga is one of my many loves!! Life changing. Try to keep your elbows in close to your sides as you descend in chaturanga. Oddly enough, I was not able to sleep last night, thinking about what I needed to round out my Super Bowl menu. Your french onion dip WHICH I LOVE popped into my head, and lo and behold here is this recipe today! Add one of my all time favorites, proscuitto, and I couldn’t be happier! The tennis (yoga?) elbow – make sure you’re keeping your elbows in very close to your body, and push down on your hand where your index finger meets your hand (does that make sense?). When starting the movement from plank, push forward off your toes so you’re more forward. Another thing that can help take pressure off the elbows is to lift up from your behind so it’s more in your shoulders – they should be below your behind when doing this. Your recipes are always so yummy and even this old cook has learned some fresh ideas from you! And my daughter loves your gluten free recipes for her little one. As far as yoga goes, you need to try Power Life Yoga (www.powerlifeyoga.com/), with four metro studios. First week is always free and you can go at your own pace starting with a Power 1 class. The instructors are great and willing to help with form questions any time after class. I have trouble with a shoulder and they have helped me adapt poses that impact that area. These look amazing!!! I had to laugh; I’ve never watched a single episode of The Big Bang Theory because I LOVED that character in Roseanne and can’t get past the actor in that role, LOL! I am going to look for that prosciutto! 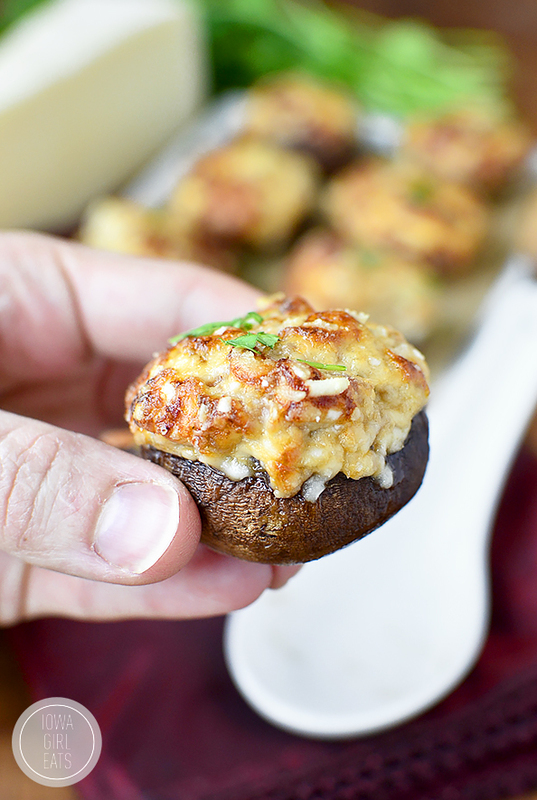 I love making stuffed mushrooms for parties and I am always looking for gluten-free variations. This one looks amazing. 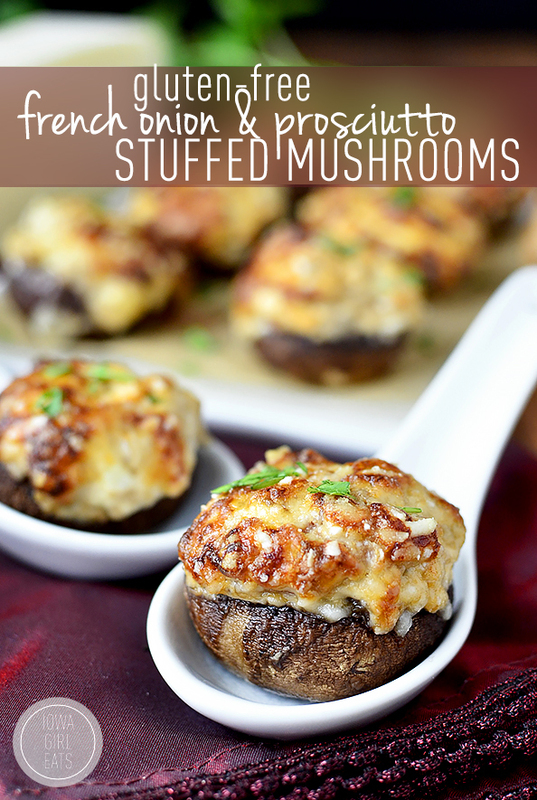 These mushrooms were really easy to make and very tasty. One thing that I found that made the recipe a little easier is instead of using a spoon to smoosh the filling into the caps, just use a little more pressure in the parmesan. The cheese is a lot less sticky than a spoon and it helps to reduce the mess/clean-up afterwards. Kristin, pillow top mattresses are the devil. Sneaky little bastards. It lures you in with it’s pillowy softness, then wrap you in it’s evil and doesn’t let you go when your alarm goes off! EVIL! Comfortable, weightless evil. I have one…welcome to the dark side. I totally forgot until now that that guy from Big Bang Theory was on Roseanne. 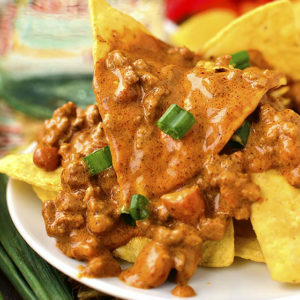 oh wow, I am dying to try these!!! Oh my word Kristen! We fixed these last night for our delayed Super Bowl party and they were a HUGE hit. Soooooooooo good! Actually “good” isn’t the right word to describe them as they were better than good. 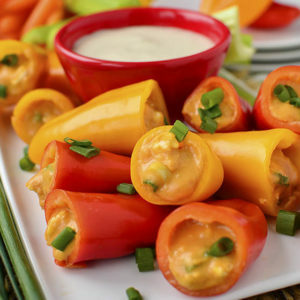 Every single one of them eaten with everyone giving them a thumbs up and saying these will now always be on our list when we have our appetizer parties. Thanks for the recipe!! My yoga instructor always tells us to roll forward with our toes/look forward and never go below parallel with the elbow to shoulder in our Chaturanga. Sorry it’s horrible to explain in type, but there are plenty of form videos available on YouTube! Hi Kristin, I’m getting ready to attend a wine party in a few weeks and we will have one GF guest this year. I’m thinking these mushrooms will be PERFECT to go along with my prosciutto wrapped asparagus. 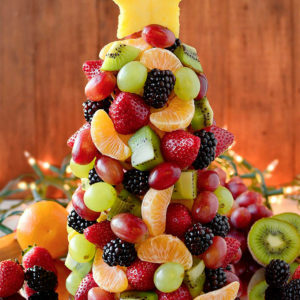 Question…do you think I could make them up a day in advance (stuffed and all), refrigerate, and then just pop in the oven right before the party? It’s on a weeknight so I don’t know that I’ll have enough time between work & party to get them done otherwise. Hi Kristin! Maybe I missed it somewheres but would you be able to tell me how much mushrooms this recipe makes approximately. doing this recipe for a wine fest event and want to make sure I have enough for everyone. thanks!!! These are delicious! My husband and I made them last night while trying out new recipes for Christmas (all while watching the Iowa game – go Hawks!) and they were so good! We’ll definitely be making them again for the whole family on Christmas. You say to put the perm cheese in a dish. You don’t say what to do with it from there???? ?